A little more than half-way through the season (give or take) the balcony plants could use a bit of a snack. When I potted them up this spring I set them in a mix of compost, potting soil, and composted-dried cow manure. (And as I mentioned for the green curtain, if I had to do it over again I would add a nice dose of calcium for added strength.) They've grown along merrily enough, but to keep them feeling flush with green and hearty in the face of the summer heat and wind I whipped up a batch of compost tea. A favorite garden beverage it's easy to make. My recipe, as always, is a bit fast and loose. I take a large container, fill it with a few inches of compost, fill it with water to the near brim, and leave it to steep like sun tea. 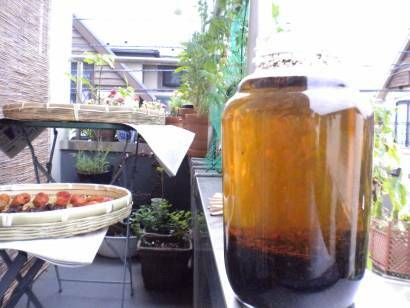 In Michigan, I used compost straight from the bin for that season, but in Tokyo I simply threw some from the bag in a jar, added a bit of leftover cow manure, and filled it with water. No cover so it could breathe and bubble to its heart's content for about a week. This morning while watering I added a bit to the watering jug, and filled that the rest of the way with water. I carried on with that process until I got down to the sludge. Once there, I added a bit of fresh material, refilled the jar with water, and have left it to sit again.